Luxury European style beddding for a grand master suite. Comforter set includes one comforter and two shams. Hand-quilted comforter with cord edge and cotton backing. Included shams feature brush fringe and faux-silk two-piece envelope closure. Faux-silk ruffled dust skirt with faux-silk diamond band. Coordinating decorative pillows and shams Set includes two shams and one comforter. Hand-quilted comforter with cord finish. Clean silk welt and solid back on sham. Solid ruffled dust skirt. Coordinating decorative pillows and shams Hand-quilted framed comforter with tied ends. Set includes two shams with coordinating 1.5" flange. Coordinating decorative pillows and shams. Ruffled dust skirt. Set includes comforter and two fringed shams. Decorative pillows and dust skirt. Oyster-hued bedding of jacquard and silk dupioni. Hand-quilted damask jacquard comforter is finished with cording and two tassels. Quilted coverlet is polyester. Pleated silk dust skirt Scallop-edged comforter finished with cording. Polyester/rayon jacquard. Coverlet made of polyester/cotton with diamond quilting. Pieced sham has floral jacquard center. European sham of polyester/rayon. Diamond grid on one side; floral on the other. Finished with a 3" ruffle. Crushed silk European sham. Silk dupioni dust skirt. Red and gold woven chenille jacquard bedding of rayon/polyester/cotton. Diamond-Lattice bedding is made of silk dupioni. A wealth of texture — from soft chenille to diamond pintucks — makes these red and gold bed linens all the more regal. Ivory polyester jacquard bedding with raised texture and ruched silk accents. Comforter is finished with a corded mini flange and gimp detail. Silk dupioni dust skirt has a 17" drop. Hand-quilted comforter. Floral sham with corded flange edge. Silk dust skirt. Floral pillow with fringe trim. Pleated silk European sham. Floral European sham is reversible. Polyester/rayon. Two corner tassels. Decorative pillows. Royale bedding mixes floral jacquard, ogee jacquard, and gold silk dupioni. Floral comforter set includes hand-quilted comforter and two shams, all finished with cording Three-piece set includes one comforter and two shams. Hand-quilted comforter with cord edge and cotton backing. Decorative pillows, shams and Faux-silk pleated dust skirt. Take yourself back to nature and peaceful south western atmosphere every time you slip under this bedding. The bedding comforter features a relaxing design woven in chenille jacquard fabric and coordinated with Burgundy and Rust patterned chenille. The stunning and opulent collection will definitely complete the lavish top of your bed ensemble in shimmering gold and black color combination. This stunning and opulent collection will definitely complete the lavish top of your bed ensemble. The bedding features a hand-quilted comforter with a twisted cord edge to register its perfect look. Its jacquard fabric has a unique texture in a copper tone that will certainly compliment the hues of your room. The stunning and opulent collection will definitely complete the lavish top of your bed ensemble in shimmering gold and brown color combination The stunning and opulent collection will complete the lavish top of your bed ensemble in shimmering. This stunning and opulent collection in brown and coral color combination will complete the lavish top of your bed ensemble. The bedding features a Peacock and Floral design in multi colors with Brown background in a contemporary woven jacquard fabric. It is accented with twisted multi-tone corded edge to complete its perfect look. Fine European linens. Quality fabrics, elegant finishings. Duvet cover and shams with flange. Sheet set. Cotton sateen. Made in Portugal. Sham with contrast picot trim border. Cotton percale. Made in Portugal. Duvet cover with contrast picot trim border. Cotton percale. Made in Portugal. Cotton percale. Made in Portugal. Sham with contrast picot trim border. Cotton percale. Made in Portugal. Duvet cover with contrast picot trim border. Cotton percale. Made in Portugal. A fashion forward Jacquard comforter set with everything you need for a complete bedroom décor makeover. The comforter features an elegant Jacquard scroll design with faux silk pleated flange. Design coordinated shams, a wide array of deco pillows and a pleated faux silk bed skirt are included to complete the look. 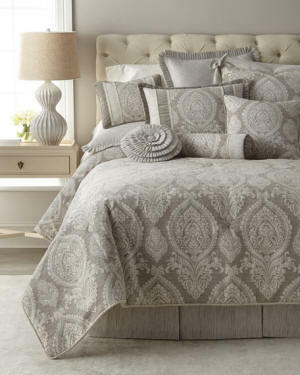 A fashion forward Jacquard comforter set with everything you need for a complete bedroom decor makeover. The comforter features an elegant Jacquard scroll design with faux silk pleated flange. Design coordinated shams, a wide array of deco pillows and a pleated faux silk bed skirt are included to complete the look. A rich, elegant Jacquard comforter set with everything you need for a complete bedroom decor makeover. The comforter features an elegant Jacquard scroll design with faux silk pleated flange. Design coordinated shams, a wide array of decorative throw pillows and a pleated faux silk bed skirt are included to complete the look. Inspired by the amazing tale of Romeo and Juliet and old world charm and crafted into pure bedding luxury textures and style. This luxurious bedding set combines textured real life floral Jacquard traditional comforter set. Engineered from the highest quality of damask fabrics and craftsmanship that is unparalleled details featured on the decorative pillows and shams. A rich, elegant Jacquard comforter set with everything you need for a complete bedroom décor makeover. The comforter features an elegant Jacquard vintage floral design with faux silk pleated flange. Design coordinated shams, a wide array of decorative throw pillows and a pleated faux silk bed skirt are included to complete the look.